Ford has announced a new Accident Management programme which will help customers organise repairs through Ford's Accident Repair Centres. 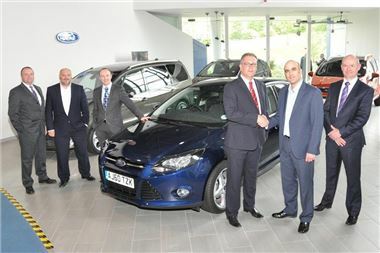 Launching in July 2011, Ford Accident Management will be provided free-of-charge for all new and used Ford vehicle owners in the UK, regardless of their insurance company. Ford owners contacting the Accident Management hotline will have repairs carried out at their nearest Ford Accident Repair Centre using genuine Ford parts fitted by Ford-trained technicians using Ford repair methods. A customer will also have the use of a Ford courtesy car, if eligible. Calls to Ford's Accident Management helpline will be handled by Innovation Group. Advisors will offer an improved service for Ford’s customers as a result of swifter communications between insurers and the company’s repair network. Paul McDermott, manager, Collision Repair, Ford of Britain, said: “We are pleased to be developing a fresh approach to accident management which will benefit our customers, our repair network and the insurance industry." "The Ford Accident Management Scheme is financed by a 10% repairer fee paid by the Ford Accident Repair Centre to our partners, Innovation Group and a small fee paid by Ford Rental to Innovation Group for administering the non-fault vehicle provision." "Unlike existing credit hire models for accident management, there are absolutely no personal injury referral fees paid, no inducement to make PI claims and the at-fault insurers are charged a maximum of 85% GTA rates for car hire." "There is no incentive for anyone to extend repairs to increase rental fees. Ford customers will not sign any credit agreements for repair or hire and will never be liable for debts if insurance companies don't settle claims."